A brand new medical drama, The Resident, arrives on Universal tomorrow (April 10) and fans can tune in afterwards for a live Q&A with the stars on Facebook. The Resident tells the story of recently graduated medic Dr. Devon Pravesh (Manish Dayal), who takes a residency at a hospital known for its famous chief of surgery, Dr. Randolph Bell (Bruce Greenwood). However, Dr Bell is hiding a nasty secret – one that other medical staff, including unconventional senior resident Dr. Conrad Hawkins (Matt Czuchry) know well. The series starts with a strong and interesting premise, although avoiding eating while watching is a must. It is a fast-paced, thoroughly engaging new drama in the packed field of medical dramas. Fortunately, The Resident has enough about it to stand apart. Its first episode introduces drama aplenty, multiple complex characters and some fascinating moral questions. The Resident is brimming with interesting characters. Driving the action is the complex Dr Conrad Hawkins, a difficult but knowledgeable supervisor to Devon. He throws out the rulebook when it comes to dealing with patients, but ultimately he knows exactly what he’s doing. We watch him much like Devon does, as an unfathomable but fascinating influence. There’s also no-nonsense nurse Nic Nevin (Emily VanCamp), the corrupt Dr. Randolph Bell and unpersonable surgeon Dr. Mina Okafor (Shaunette Renée Wilson). The show also makes a noticeable effort to include a diverse cast, including talented and strong-willed women as well as people of colour. Some storylines relate especially to this, giving the show more depth than the standard medical drama. 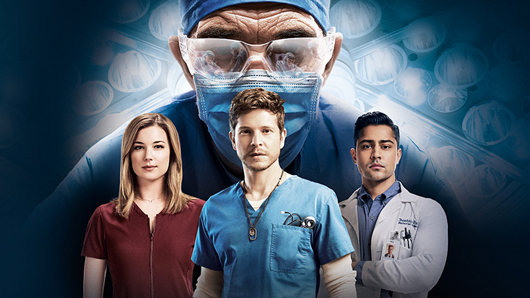 Fans who enjoy The Resident can tune into Facebook Live immediately after the episode to ask the cast, including Matt Czuchry and Emily VanCamp, questions about the show. The Resident airs on Universal Channel at 9pm on Tuesday, April 10. The Facebook Live session will start at 8.30pm, with a Q&A session from 10pm.